Gary Presley: BOOK REVIEW: "I Won't Take the Mark"
BOOK REVIEW: "I Won't Take the Mark"
Reviewing books for several venues, I am often contacted privately and asked to review a book. 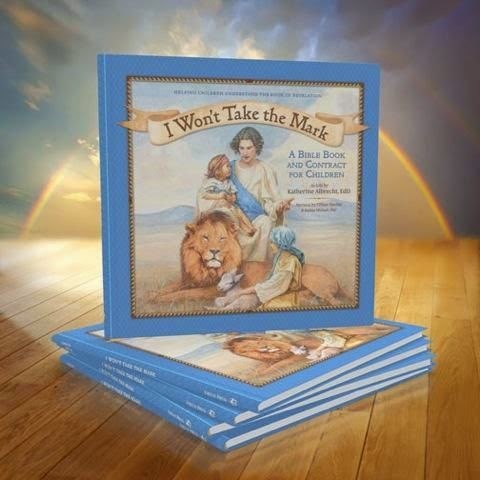 Recently, I was emailed by Katherine Albrecht, Ed.D asking for a review of her children's book, I Won't Take the Mark. I was hesitant. I don't review children's literature. However, I've always been interested in the interpretation of the New Testament's Book of Revelation. Also, my wife, who has a better, more personalized ideal of religion than me, thought it might be an interesting book to read to our 5-year-old daughter. But I said, "Yes." The book arrived. We have read it. It was, in essence, as I expected: it is nicely illustrated rendition of the Book of Revelations with simplified interpretations of the text on one page, with the Biblical text from the King James version of the Bible on the page opposite. Readers should note, though, that the characters—most importantly, the renditions of Jesus—are based on modern people, although there are people of color. Jesus, in fact, looks like the typical Anglo. I suspect here, as elsewhere, such unrealistic portrayals are made to create empathy. Readers should also be aware that some images might be disturbing, such as a guillotine. In spite of some of the more disturbing illustrations, the book is directed toward children up to ages of 10-to-12. As noted, its theological audience would be conservative Protestant, and within that group, believers who approach the Bible as the literal Word of God. My wife read it to our daughter two or three times, and our daughter, in fact, asked me to read it to her, which I did. My wife and I found the language focused accurately on the audience—that is, it is consistent with language comprehensive of children between the ages of 5-and-12 years of age. My wife especially liked that it reinforced Bible verses with plain language, which will make it valuable to those who adhere to the theology expressed. A text more in keeping with our Roman Catholic beliefs would not rely on a literal interpretation of Biblical texts. It is not here for me to explain fully the Roman Catholic approach to the Bible, but I personally believe there is power in symbolism. Truly, it is my personal opinion that there is no other method of interpreting the "holy mystery" which is creation without symbolism and metaphor. With that in mind, I believe any discussion of "the mark of the beast" is an element of Holy Scripture interpreting end times requires metaphor. For example, I have a small tattoo of the infinity symbol. My daughter asked me if that was the mark of the beast. "How about when we go to the fair and I get my face painted?" she asked. "Is that a beast mark?" That, perhaps, is the sort of question a parent should be prepared to answer when reading this book to a child. My wife and I both believe evil is manifest in this world, and so we tried to reassure our little girl that one of the Creator's gifts is free will, that there is a right to say "No," to reject evil, when it perceived to be present. Is that part of the Book of Revelation? It is, in the sense of those of us who believe that even as metaphor Revelations reminds us that evil is real and eternal, and it acts in this mortal world. Recognizing from the overwhelmingly positive Amazon reviews that there is an audience for Albrecht's children's book, I can recommend I Won't Take The Mark for an evangelical Christian audience. Other believers will find merit in it, but a thoughtful parent will be prepared to answer questions from youngsters who are confused or disturbed by the complex theology (interpreted in Albrecht's book) within the Book of Revelation.